All Sorts of Sweet Pea Baby Shower Ideas! Every baby is a Sweet Pea and that makes it a perfect theme for a baby shower. A Sweet Pea baby shower is a great theme for the Spring or Summer or if the baby's nursery has a green or garden motif. If the upcoming baby is a girl, you have a Princess & The Pea theme, which is very cute! One quick distinction: Sweet pea is both a garden pea and a climbing plant with sweet-smelling flower that come in a wide range of colors. So when you choose a sweet pea theme for your baby shower, you could either do a sweet pea flower theme (pink) or a pea pod theme (green). I have included pink and green invitations & games for both themes. I think the best idea for cute and easy invitations is using vellum. Vellum is a thin, semi-opaque, semi-clear, milky colored paper. How is vellum used? To make invitations for a Sweet Pea baby shower theme, first go to a scrapbook or craft store and buy some sheets of Sweet Pea, green, or garden paper. You can get at least 2 invitations from one 8½ by 11 inch sheet (depending on how big or small you make the invitations). A 4” by 6” invitations is a recommended size. Also, at the store, buy the same amount of sheets of vellum. Also buy some ribbon or metal brads. You can use either the ribbon or brads to fasten the vellum to the paper. Come Celebrate Sarah Hansen's Little Sweet Pea! Next, cut your Sweet Pea themed paper to 4” by 6” size. Then place the vellum on top of the Sweet Pea themed paper and fasten it at the top with two brads, equally spaced in the center. Or punch two holes, equally spaced (about 1-2 inches apart) in the vellum and the paper; then loop come ribbon through both the paper and the vellum. If you don’t want to use vellum, you could follow the instructions above, but instead of printing the wording onto vellum, just print the wording on a light-colored green or white paper. Cut to size and you are done! Start your Sweet Pea baby shower decorations with green and white balloons (filled with helium) scattered throughout the party room. You could tie them in groups of two (one green one and one white one). The round shape of a balloon resembles a pea shape. Then buy some green confetti to sprinkle on the gift table, on some of the surrounding furniture, and/or around the serving area. Green streamers are an excellent party decoration. You could buy green and white streamers and twist them together as you hang them to the ceiling of the party room. Or you could use green and pink streamers if the baby is a girl, or green and blue if the baby is a boy. Dress up your serving area and/or gift table with a green table cloth. Here is a very cute Sweet Pea Centerpiece: Make a little arrangement of peapods (you can buy these in the salad/produce section of any grocery store) and arrange them around a sugar jar for "Sweet Pea"! Make your own baby shower diaper cake & decorate it with light green ribbon, light green socks, a light green onesie, a light green bottle, light green burp cloths, etc. A big bouquet of green and white balloons would be fun and festive and would make a great Sweet Pea baby shower centerpiece. Get them the day of the baby shower (so they don't go flat) and tie them to the gift table or the Mother of Honor's chair. This is a sweet and fun baby shower activity that is meaningful for the expectant mother. 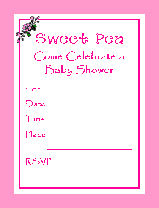 Preparation for this baby shower game: Print off a copy of this Mother's Sweet Pea Baby Shower card for each of your guests. How to play: Give each guest a copy of this Mother's Sweet Pea card and a pen or pencil. Have them write down a memory they have of something that their mother did for them when they were young that made them feel like a "Sweet Pea". Have everyone read theirs when everyone is finished and then collect the cards and give them to the expectant mother to always remember. Here is a fun & free printable Sweet Pea baby shower game to play. Every word in the crossword has the letter "p" in it and they all have something to do with a baby! Preparation for this baby shower game: Make a copy of this Sweet Pea Crossword for each of your guests. How to play: Give each guest a copy of the Sweet Pea Crossword and a pen or pencil. They must use the Across and Down clues to fill in the blanks on the card. The first one to correctly fill in all of the words is the winner! This game is a great one for a girl baby shower. You will need several small presents for this game, packages of candy or candy bars work well for this gifts. Have all the guests sit in a circle, and hand out your small gifts randomly to guests in the circle. Print out a copy of The Princess and the Pea fairy tale . Then explain that as you read the story (or you could have the mommy-to-be read the story), everytime they hear you read the word "princess" they pass the gift to the right. At the end of the story, whoever is in possession of the gifts gets to keep them! This game requires no skills but it is fun and livens up the party. AND it is a perfect game for a "Sweet Pea" or "Pea in a Pod" baby shower theme. Be sure to buy a jar of Peas baby food for this one! Preparation for this baby shower game: Buy 8 or more jars of baby food of all different flavors. For fun, buy 2 or 3 very unique flavors. Cover the label of each jar with paper or aluminum foil so that the name of the flavor is covered. With a marker, write a number on each jar from 1 to 8. How to play: Pass each guest a paper plate, a notecard, a pen, and a plastic spoon. Have everyone number their paper plate from 1 to 8 (or more), evenly spacing the numbers on the outer rim of the plate. Pass around the jars of baby food and instruct each guest to scoop a little spoonful of baby food out on their plate, each flavor to a different number. Then everyone tastes each flavor and writes down on their notecard what flavor they think it is. When everyone is finished, remove the covers off of the jars to reveal the flavor of each jar. Whoever correctly guesses the most flavors is the baby food queen (or king). Be sure to take pictures of the funny faces! This game is incredibly fun and incredibly messy! So it is best to do it over a laminate floor or outside. Use green Jell-O for this game - it will fit in with your green decor and theme. Preparation for this baby shower game: Prepare one bowl of green Jell-O for each guest. Do this the day before the shower. How to play: Divide the guests into teams of 2 and have them sit facing each other on 2 chairs. Place a towel or large plastic garbage bag over each one for a bib. They're gonna need it! Give each guest a plastic spoon and a bowl of Jell-O. Then blindfold each of the two guests and say GO! They must feed each other as fast as they can. Give them 60 seconds to feed each other and at the end of the time, see how much of their Jell-O has been eaten. Then have another team go. Whichever team eats the most is the winner! (a team could "finish" their Jell-O, but it could just be all over the other person and not actually "eaten") Have each team perform separately so everyone can watch everyone else. Everyone will be laughing so hard! Any green-colored food is a great choice for a Sweet Pea baby shower! These sandwiches are not green, but they have peas in them and are delicious! Combine chicken, vinegar and salt. Let stand while preparing rest of the ingredients. Gently toss together all ingredients, and serve on crisp lettuce. Or for sandwiches, serve on croissant rolls. Best of Wishes on Your Sweet Pea Baby Shower!